Two weeks ago, after Pakistan's test match against Ireland, I wrote about why Mohammad Abbas was Pakistan's new pace spearhead. In that article, I showed that Abbas has an average, strike rate, and economy among the world's best in the past year since his debut, and that he is also Pakistan's second highest wicket taker in Tests in this period. At Lord's, Abbas lived up to this new reputation of being Pakistan's pace spearhead, picking up the man of the match award for his 8-64, the best bowling figures by a Pakistani pacer at Lord's. Abbas' 8 wickets at Lord's took his tally to 40 wickets after just 7 test matches at an exemplary average of 16.6. 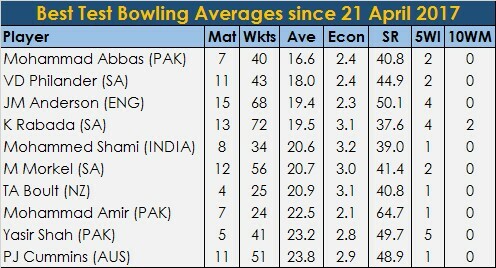 No other bowler in the world has a better average than Abbas does in the period starting from 21 April 2017 (min 20 wickets). He is a clear 1.4 runs per wicket ahead than the next best average. His economy rate and strike rate are also right up there. Abbas' 40 wicket in just 7 tests is the highest tally of wickets after 7 tests among all Pakistan test bowlers. He is miles ahead of legends like Imran Khan, Wasim Akram, and Waqar Younis were and also significantly ahead of his peers, including Yasir Shah who holds the Pakistan record of being the fastest to reach 50 wickets. Abbas' average and economy rate after 7 tests is also significantly better of all other Pakistan test bowlers at the same stage of their respective careers; while his strike rate is slightly behind only Mohammad Asif's. While there are many bowlers who have taken more wickets in their first 7 tests, almost all of them belonged to another era. In more recent times, only Vernon Philander with 51 wickets was ahead of where Abbas is after 7 tests. Besides that, everyone from Glenn McGrath, to Allan Donald, Shaun Pollock Dale Steyn, James Anderson, Stuart Broad, Courtney Walsh, Curtley Ambrose, Malcolm Marshall and even the likes of Kapil Dev, Richard Hadlee, Sir Ian Botham, and Dennis Lillee had fewer wickets than Abbas does after 7 wickets. That is quite a list of name that he has bettered. The yesteryear bowlers from another era who had many more wickets than 40 after 7 tests include the likes of Sydney Barnes, George Lohmann, Frank Tyson, Rodney Hogg, erry Alderman, Charlie Turner, Alf Valentine, and few others. Mohammad Abbas has had a sterling start to his test career and he is forging full speed ahead as Pakistan's main pace spearhead. He has a long road ahead but with the start he has had, he is already miles ahead of all the legends that ever bowled for Pakistan.